“Its Saturday, so everything is a bit quiet,” Lok Chitrakar heaves a sigh relief as he leads me to Simrik Atelier, his studio in Patan Dhoka seemingly serene. The serenity dies down as he sips his coffee from a red mug in a bright airy studio surrounded by framed paintings. 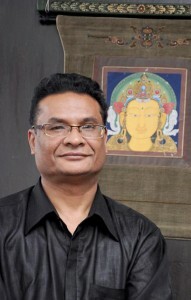 His studio was a world where gods and demons fight and make love on canvas.Chitrakar has mastered himself in Paubha, a traditional Newari art form that depicts Hindu and Buddhist deities and tells religious stories. Ritualistic symbolism and tantric elements are used to depict these gods and goddesses in their different “mudras” (posture). Paubha is making a comeback in the Nepali art scene after almost a hiatus of two centuries. “You need to be very precise when it comes to Paubha,” says Chitrakar. “Every stroke, symbol or colour means something. And the most important thing to consider is the lining. Every object that is drawn needs to be lined perfectly,” he points out with precision displaying a painting of Chinta Mani Lokeshwor searching for the Kalpa Brikshya. Paubha is not considered to have taken a final shape until all the details come to a point where they can be easily distinguished. Even though the painting Chitrakar was exemplifying gave an impression that it was complete, apparently there were still few details that needed to be added. “I hope to finish it this month” he adds.